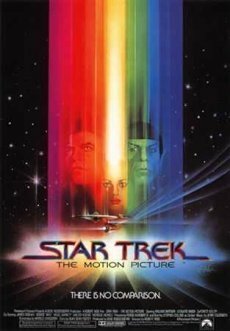 Buy Star Trek - The Motion Picture: The Director's Cut (Two-Disc Special Collector's Edition) at amazon.com. 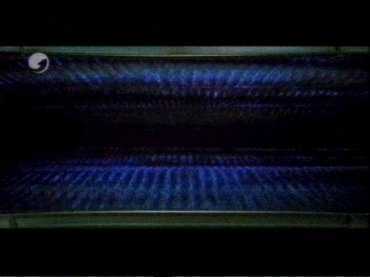 Comparison between the Theatrical version represented by broadcast on the German Free-TV-network Kabel 1 and the Director`s Cut represented by the German DVD. 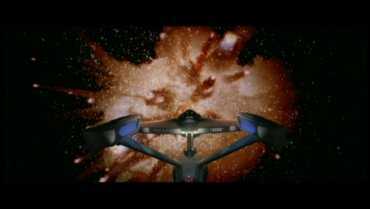 After more than 20 years director Robert Wise was offered to rework the first part of the Star Trek-franchise, again. 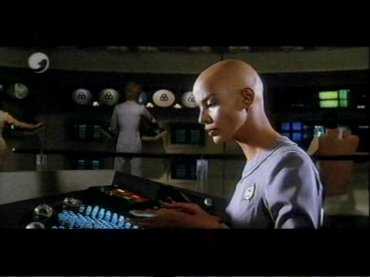 Some new scenes have been added, some scenes from the Theatrical version have been deleted and some scenes got a digital makeover. 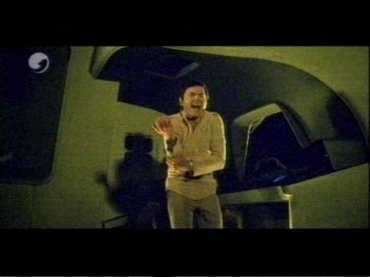 The Director`s Cut begins with an overture to give us the right mood.  We only see the almost empty space and just a couple of stars that pass by. 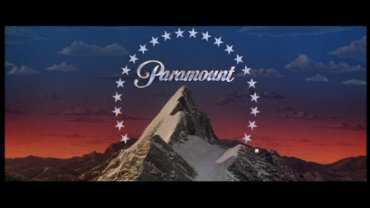 After that, the Paramount-logo is being shown. 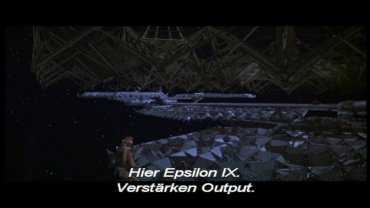 We see the outpost Epsilon IX. 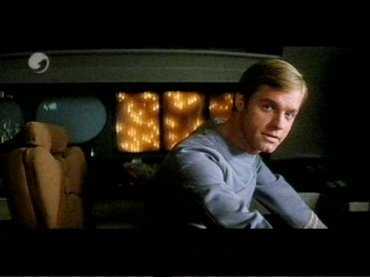 In the foreground a crew member in a spacesuit can be seen. 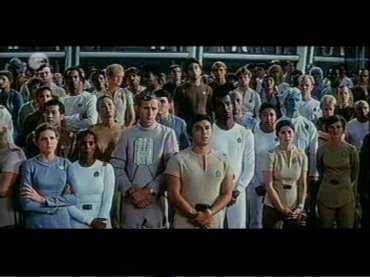 In the Theatrical version the order is different. 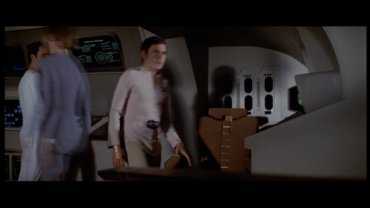 Here, we see a crew member approaching us and in the next scene we see another one rising from beyond and moving away from us. 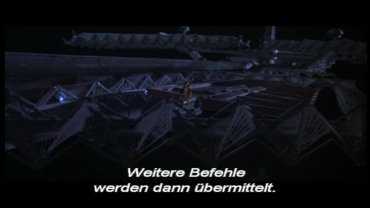 Here, it is the other way around. 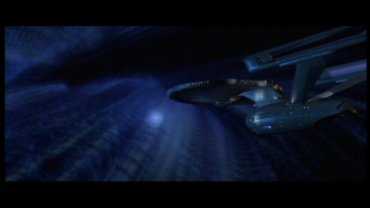 First, the crew member floats upwards. 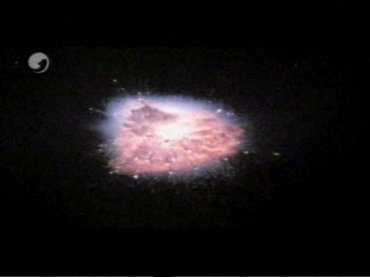 Then away from us, in the next shot he is approaching us. 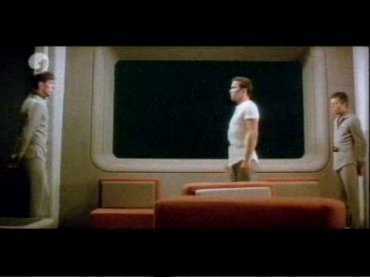 While the Theatrical version shows us two people in open space, the DC makes it clear that it is the same person. 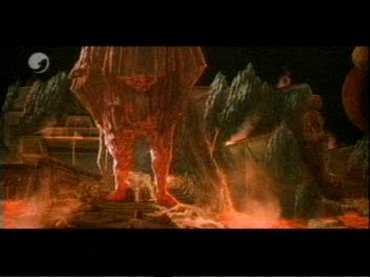 This shot is missing in the DC. 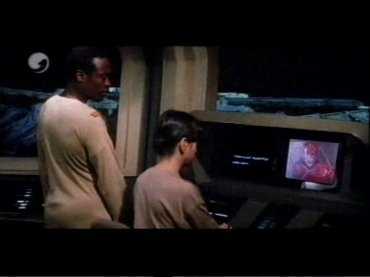 2 crew members observe the radio transmission of the Klingons with the cloud. 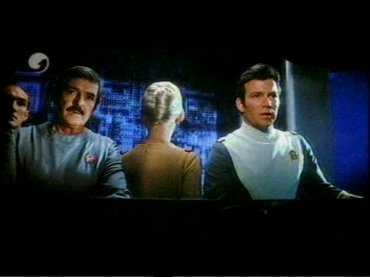 In the Theatrical version we see those two with their supervisor. 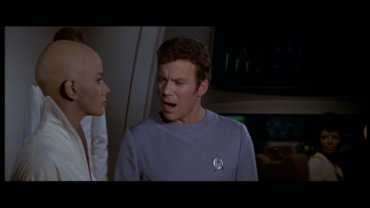 The tell him about the cloud and the Klingons. 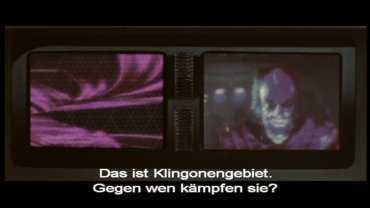 The DC contains the same dialogue but shows more images of the Klingons and the cloud. 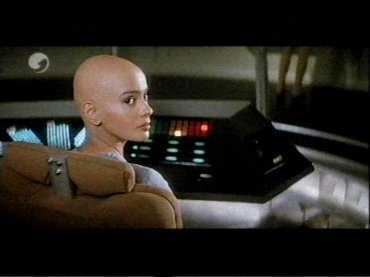 In the Theatrical version Vulcan still looks like this. 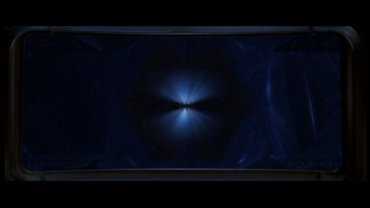 The camera pans down. 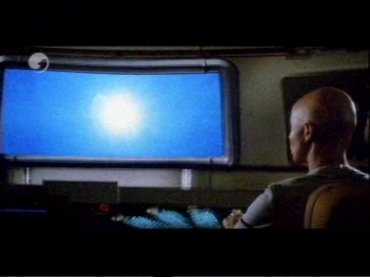 We see the planet Vulcan. 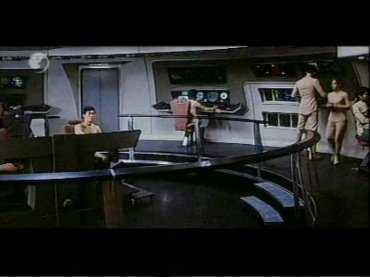 In the Theatrical version the altar that Leonard Nimoy (as Spock) approaches looks like this. 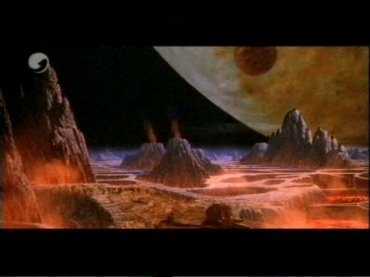 In DC it looks clearly better. 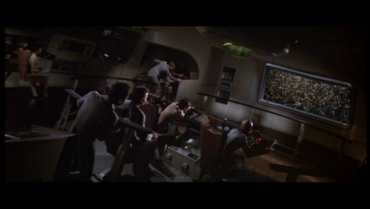 We are on earth, near the space navy commando near San Francisco. 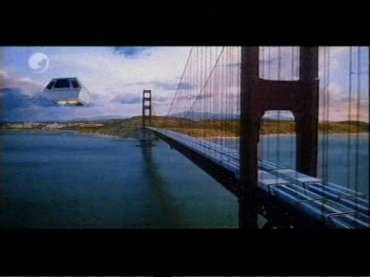 The flight of the shuttle past the Golden Gate Bridge is noticeably shorter. 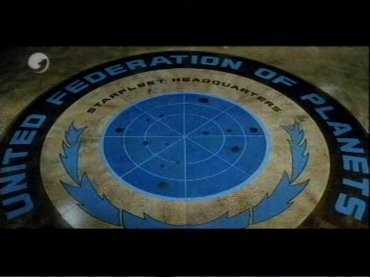 Here, we get to see a close up of the United-Federation-of-Planets-logo, instead. 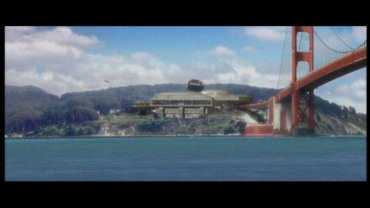 Here, the surroundings of San Francisco look more futuristic. 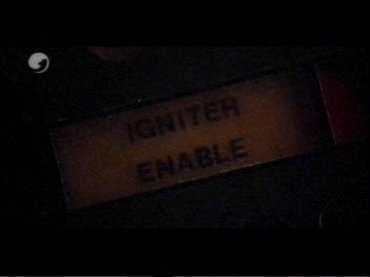 This is also being used for a longer sequence of the shuttle flight. 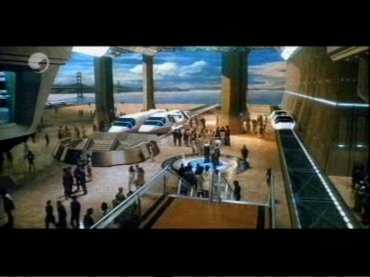 Here, the old shuttle-base can be seen. 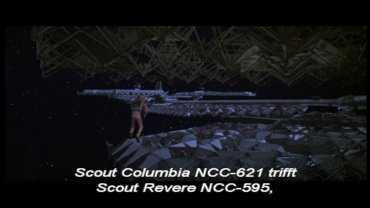 For the DC, the shuttle-base got a makeover. In the right more airfields can be seen and the entire location of the base seems to have been relocated because the background shows more of the coast and the bridge. 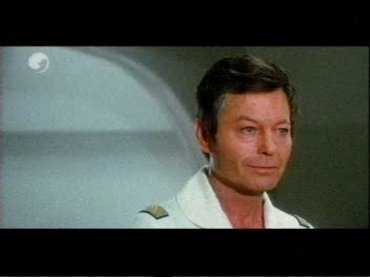 Admiral Kirk has just left the bridge. 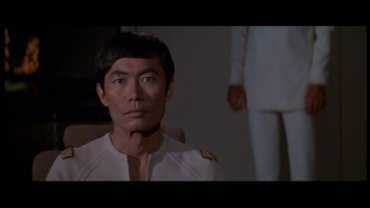 George Takei (as Hikaru Sulu) says that he (Kirk) wanted them back and that he he got them. 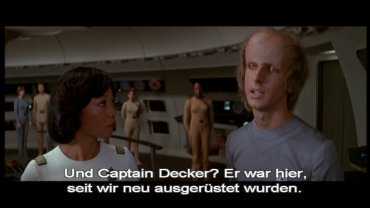 A member of the crew expresses his concern and asks about Captain Decker. 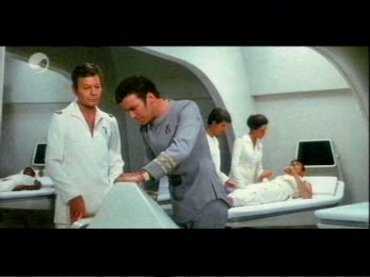 He says that he has been there since they got the new equipment. 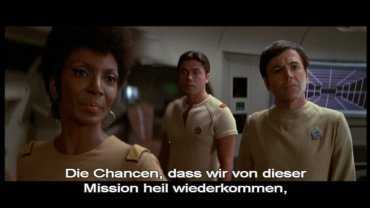 Nichols (as Nyota Penda Uhura) responds that the chances to return safe from this mission have just doubled up. 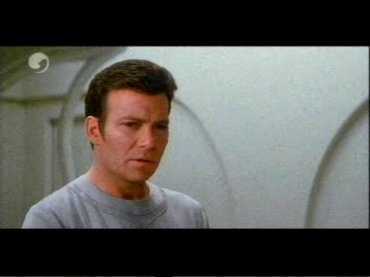 In the DC right after the accident with the transporter the line from William Shatner (as Admiral Kirk) is missing: "Oh my God"
Now, the DC lacks the remark from Admiral Kirk when he says that they suppose that there is some strange airplane beneath the clouds. And once again, something is missing in the DC. 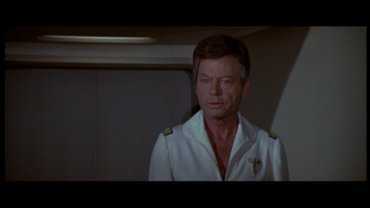 Admiral Kirk says that they can only hope that there are creatures on board whose power of judgment is equal to ours. 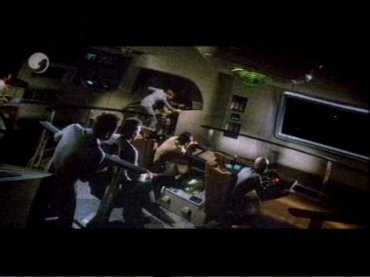 Admiral Kirk gives the order twice to turn off the monitor. 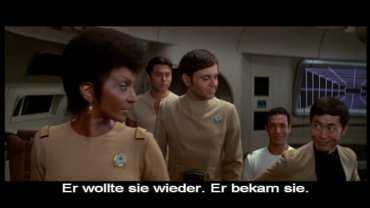 And the shocked Uhura only reacts after the second time. 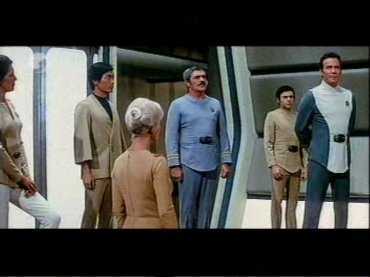 This, however, only happens in the off, we only see the frozen crew. 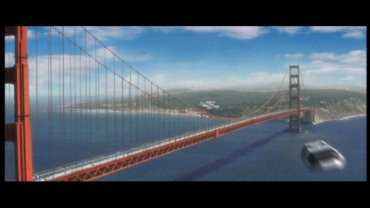 Now, the DC lacks a short shot of the bridge. 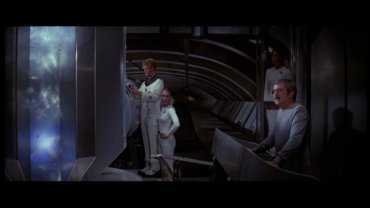 From the board loudspeakers we hear the voice of Scotty who says that preparations for torpedo absorption are in progress. 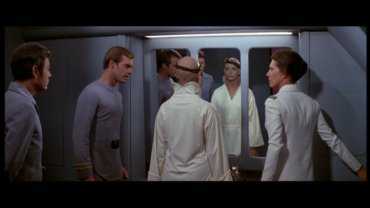 Admiral Kirk enters the transporter room. 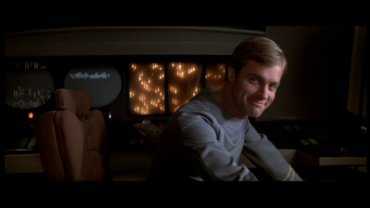 He asks Ellen how the time delay happened. 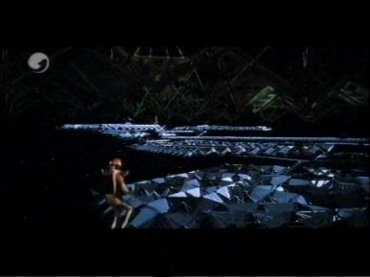 She says that downstairs somebody was afraid of the beaming and the others were supposed to go first. 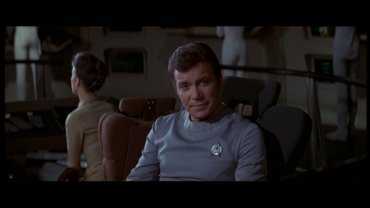 Admiral Kirk seems to know this behaviour and with a smile on his face he already has a theory who it might be. 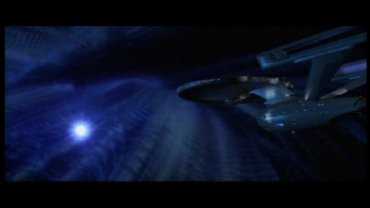 Now, he gives the order to beam the last passenger. 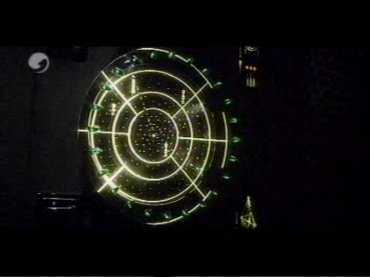 In the Theatrical version we see this radar screen. 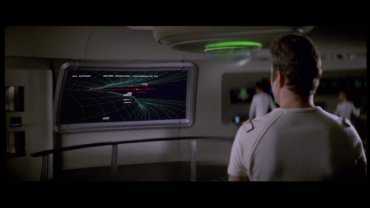 Ilia confirms Decker's calculation. 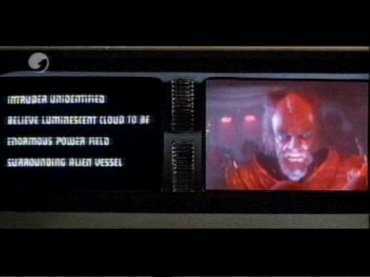 Now we see the images that the DC showed at 37:22 min. 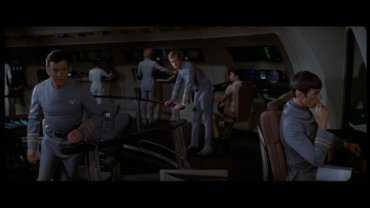 Here, the exploding asteroid is shown in a close up, cut to the bridge crew, cut to Ilia seesawing a little fatuously under the influence of the wormhole. 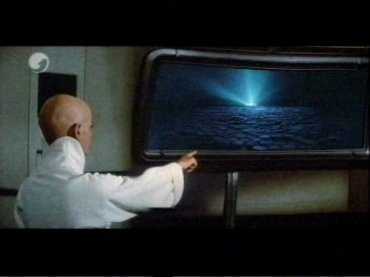 Shot from behind but we hardly get to see anything on the screen. 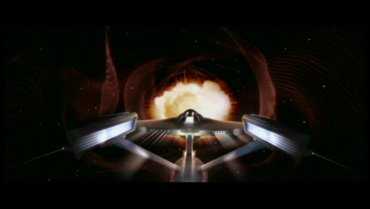 Here, the Enterprise can be seen in the foreground during the explosion. 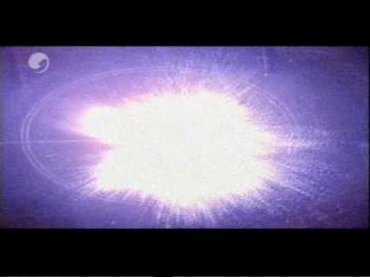 The explosion seems a lot more spectacular, too. And again the shot from behind only here, showing the rests of the happening on the screen. 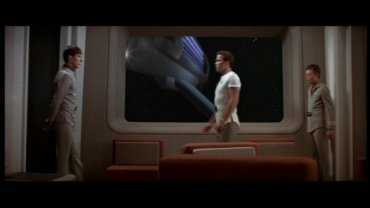 Ilia looks at the leaving Decker. 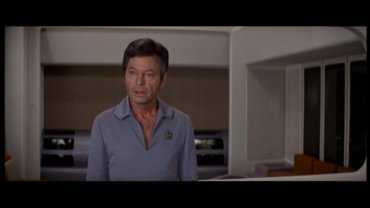 Kirk and DeForest Kelley (as Dr. Leonard McCoy) to Spock. 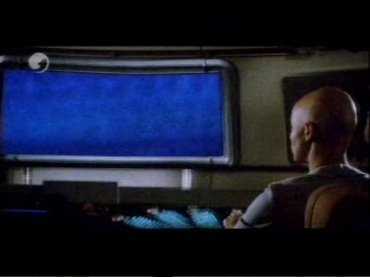 Here, we do not see anything in the window. 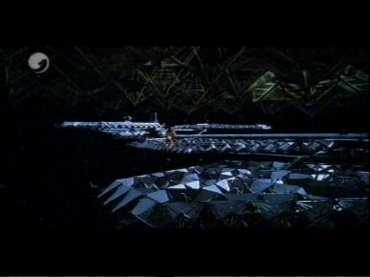 For the DC the right warp-pod has been added. 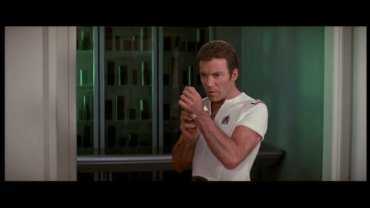 Kirk and McCoy talk about Spock. 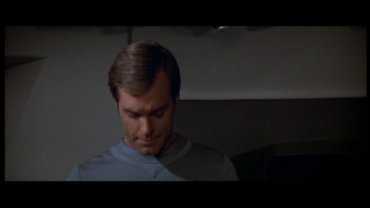 McCoy aks if one can be sure about that with anybody. 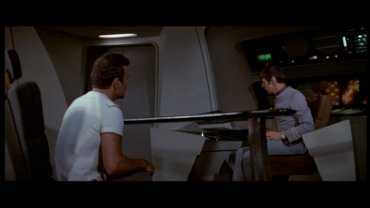 Before Kirk gets to answer he is called away over the speakers from the bridge, he responds that he is on his way. 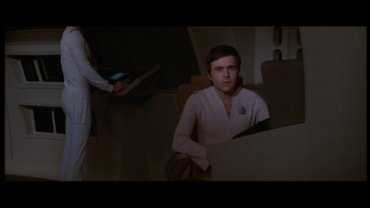 Walter Koenig (as Pavel Chekov) was injured at his arm. 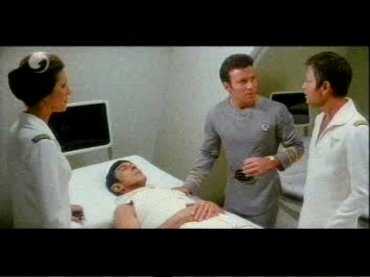 Kirk calls the paramedics. 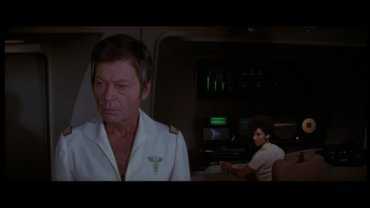 In the DC Ilia abandons her post immediately, from the off we hear Kirk calling the paramedics. 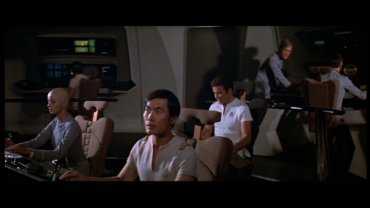 Without turning around Sulu says to Kirk that the new screens held up. 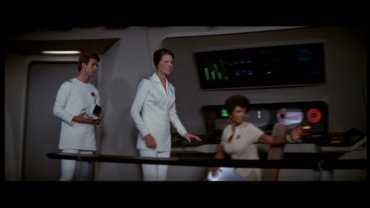 Majel Barrett (as Dr. Christine Chapel) comes to the bridge with an assistant. 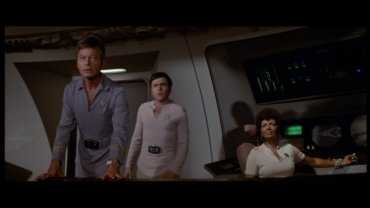 Uhura sends her to the injured Chekov. 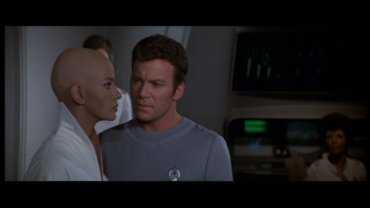 She meets Ilia and wants to start with the treatment. 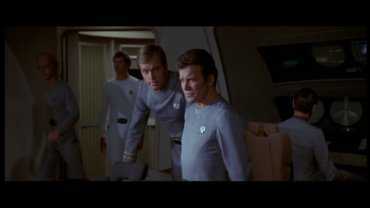 Ilia says that she could take his pain away. 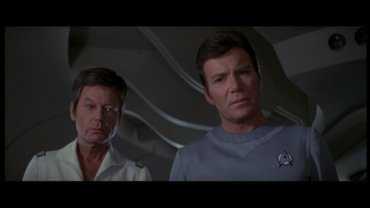 Dr. Chapel is a little puzzled but lets Ilia go on. 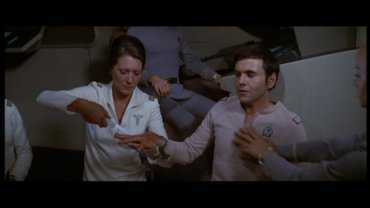 Now, Ilia closes her eyes, puts her hands on Chekov's shoulder and concentrates. 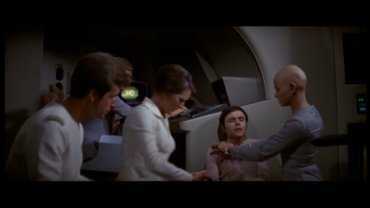 A few seconds later he is free from pain and says thank you to Ilia. 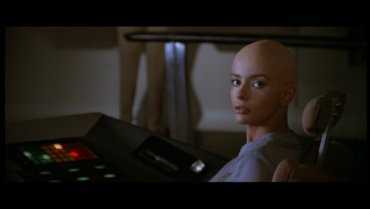 Now, Dr. Chapel starts treating her. 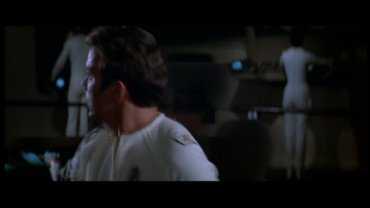 Ilia pulls back her hands slowly. 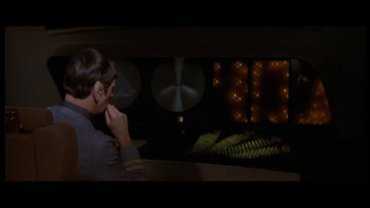 Spock plays the incoming message from the cloud to the general. 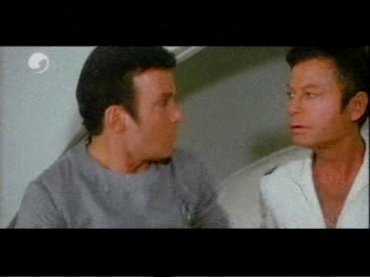 He reports him the facts, that the message only lasted for one millisecond. 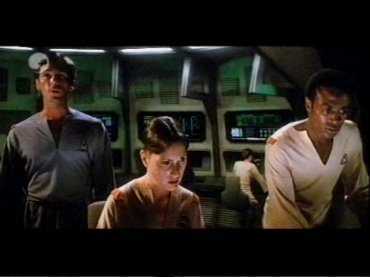 Over the intercom the admiral demands a status-report from the engine room. 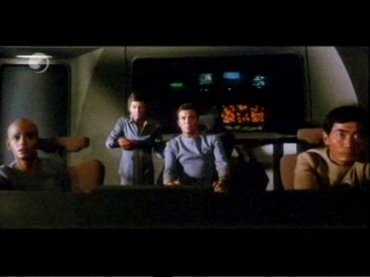 Here, the same scene only using a completely different shot. 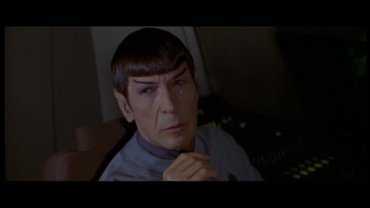 Decker looks at Spock worried. 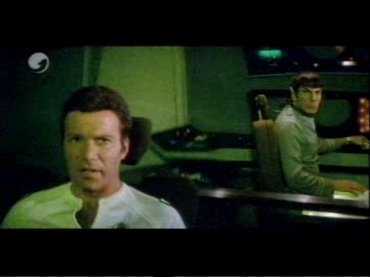 Admiral Kirk turns back to the main screen. 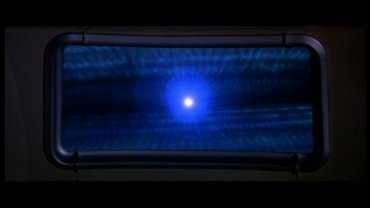 We see on the main screen how the energy-ball dissolves into nothingness. 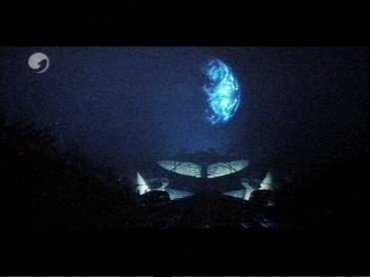 First, we see the energy-ball on the main screen and directly after that from the outside. 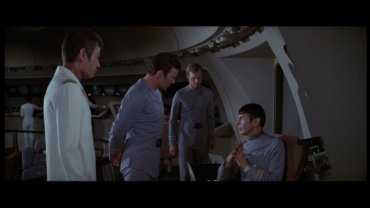 Kirk orders Sulu to keep the current position. 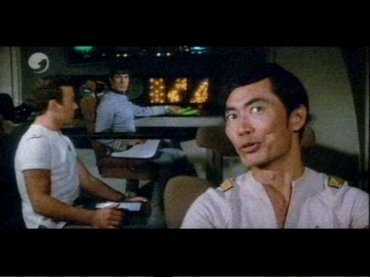 Sulu repeats the order to confirm it. 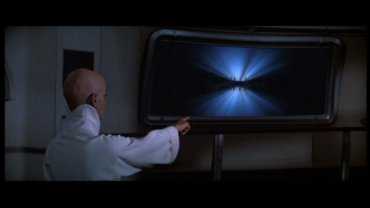 Ilia reports the current distance to the cloud. 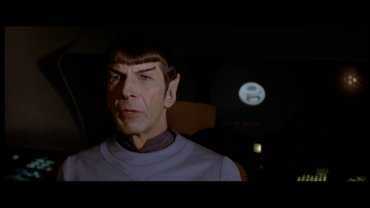 Spock tells his theory about the cloud to Kirk. Decker shares his thoughts, too. 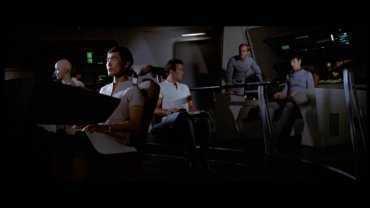 Kirk demands to see the tactical position on the screen. 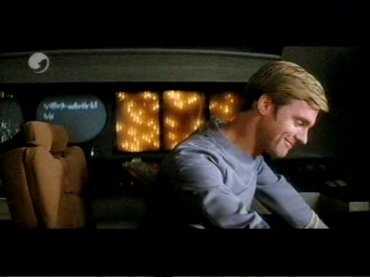 Same here, only we get an over the shoulder shot from Kirk. 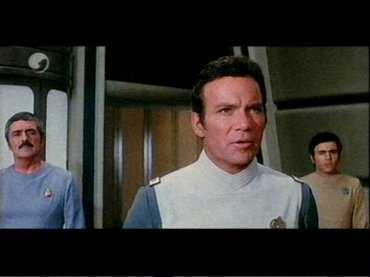 To get to his position Chekov passes behind McCoy. 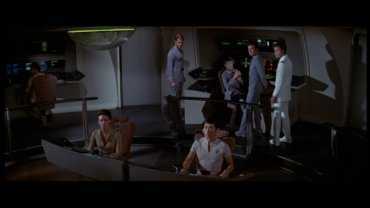 A female crew member makes room for Chekov. 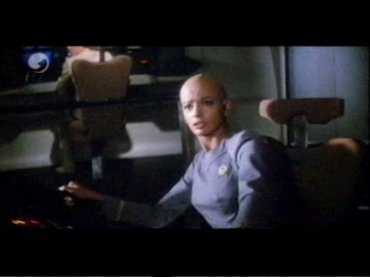 Dr. Chapel gives the "probe"-Ilia a headdress . 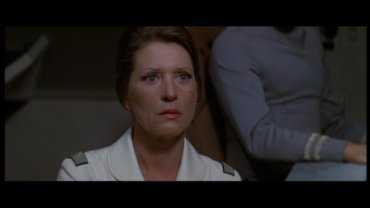 Decker and McCoy watch her. 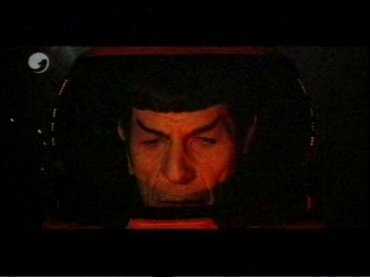 Spock listens to the computer's instruction how his rocket-suit works. 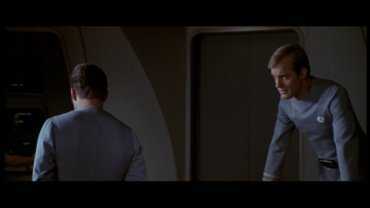 McCoy interrupts Kirk when he hassles the weakened Spock a bit more with his questions. 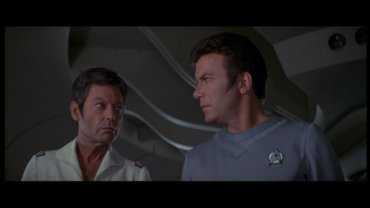 Kirk expresses his thoughts about the mission from Viger. 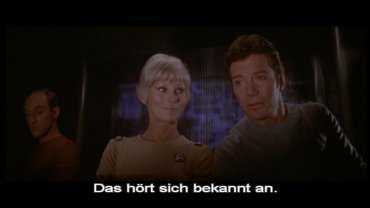 McCoy cannot understand it, either. 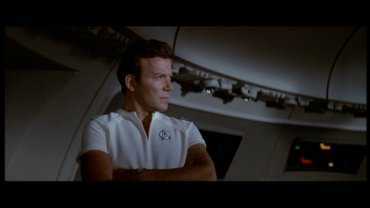 Now, Kirk asks Chekov about Decker's position. Here, in a profile shot and looking much better. 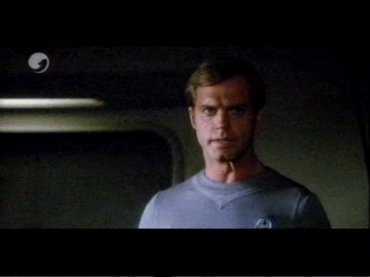 Kirk tries to find out why Viger and the probe-Ilia want to erase all the carbon-units (humans) on earth. 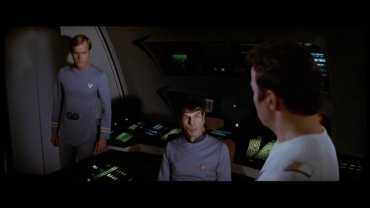 McCoy gets the idea that Viger supposes that the creator is a machine. 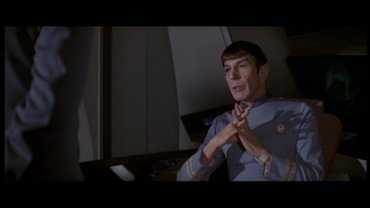 McCoy is very tense, too. 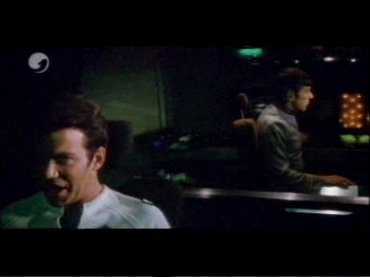 Kirk turns to Spock and wants to ask him something, at first he does not react. 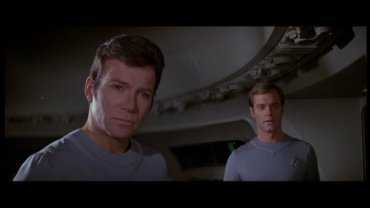 Kirk gets up and walks to Spock's seat, he turns around and suddenly Kirk sees tears in the Vulkan's eyes. 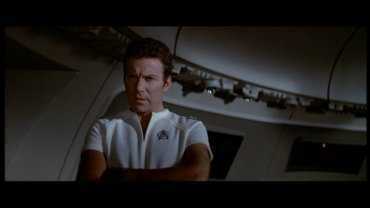 Kirk asks, slightly ironically, if he cries because of the crew. 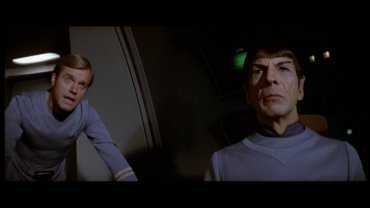 Spock answers that he is crying for Viger like for a brother and with several points he explains Viger's mission by comparing Viger's history to his own. 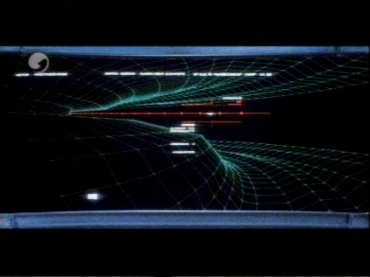 The Ilia-probe shows Viger on the screen. 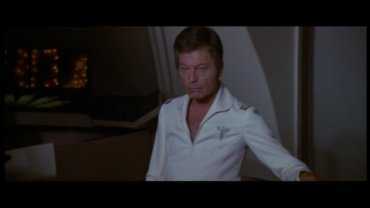 In the Director`s Cut it looks much better. 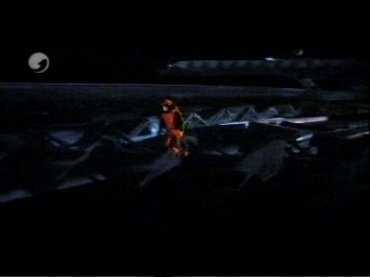 Unfortunately, the end credits have not been broadcast on television.